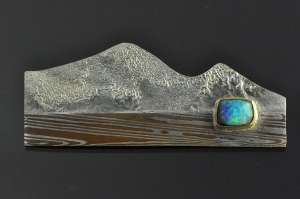 Welcome to Bob Wyber’s Contemporary N Z Jewellery web-site. Bob is a Dunedin, New Zealand based designer/maker. This is your opportunity to purchase modern, hand crafted NZ jewellery featuring innovative design, materials, and techniques. It is the individuality of each piece that makes Bob Wyber’s contemporary designer jewellery so different. Brooches, pins, pendants, necklaces, earrings, ear studs, cufflinks, rings, bracelets, cuffs and charms. N Z designs including Korus, symmetrical and asymmetrical pieces, N Z land and seabirds, feathers, landscapes, leaves, seedpods, seascapes, big waves, sea life and shells. Sterling silver, 18ct and 22ct gold, Mokume Gane, bronze and copper. Pounamu, diamonds, natural found Paua pearls, Pacific Black pearls, Paua shell, Queensland Boulder opal, Ethiopian Welo opal, Carnelian, Amethyst, Maw Sit Sit, Sugilite, Sapphires, Star Rubies, foliated schist, fossils, Tektites, Azurite, Turquoise, and other minerals and gem stones. Hand crafting such as fabrication, reticulation, hammer forging, texturing, granulation and darkening. Sign up to receive my newsletter updates. Your details are safe and will not be shared in any way.